Based at the Maple Terrace Motel in Williamstown, Massachusetts.Rides are 35-50 miles with terrain varying from the flat Ashuwillticook Rail Trail to the challenging climb over Mount Greylock. Google Map for Maple Terrace Motel. Brodie Mountain / Jiminy Peak Loop with Petersburg Pass extra 7.5 mile option. This ride takes Rt. 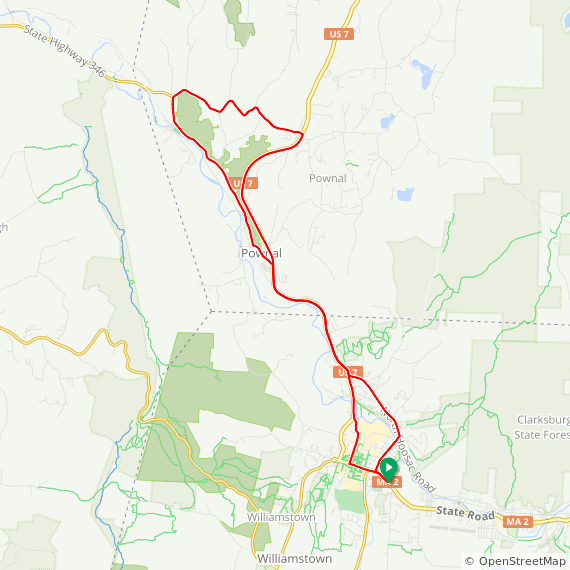 7 south to New Ashford, and then climbs around Brodie Mountain, with a nice downhill section to Jiminy Peak ski area. The return is uphill for a couple of miles, and then generally downhill all the way back in to Williamstown. 1900 ft. of climb over 29 miles, with the option of an extra 7.5 mile loop up to Petersburg Pass on Rt. 2 and back down for an extra 1200 ft. of climb. 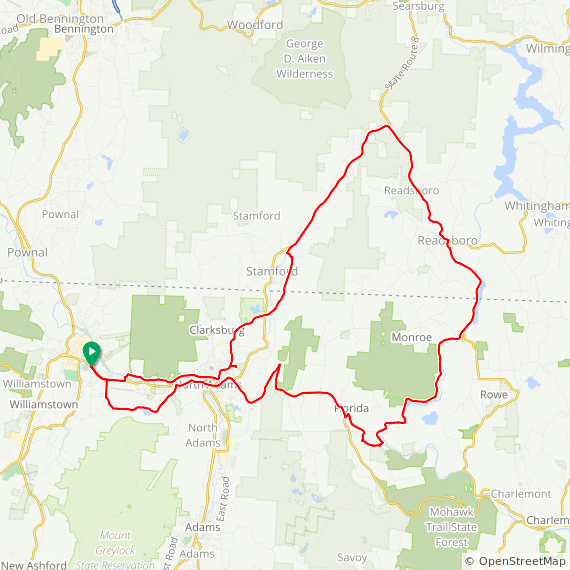 Pownal (Short Version of Bennington Ride):1 9.4 miles, 1,366 ft total elevation (Average climb/descent for ride is 2.8%). Begins with 5 mile easy climb The Short Version of this ride takes us to North Pownal. 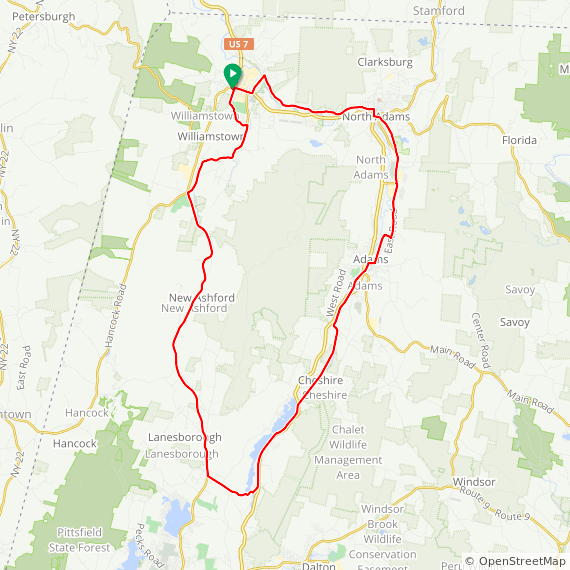 VT. After a fantastic downhill section, you have the option for an extra 10 miles with a climb over the Petersburg Pass, or take the easier route back to Williamstown. View at RideWithGPS. 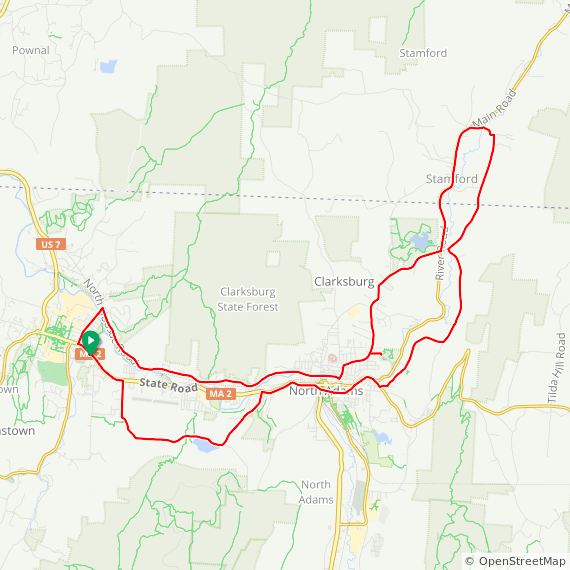 Ashuwillticook Rail Trail and around Mount Greylock: 40 mi., 1820 ft. total elevation, mixture of flat and some long climbs. View at RideWithGPS This 40 mile ride takes back-roads through rural Hancock with a few short steep climbs, and then descends to Lanesborough, MA. At this point you have the choice of either riding over or around the mountain. Around the mountain continues on the wonderful Ashuwillticook Rail Trail through Cheshire to Adams (the only flat section of ride on this tour). “Over the Mountain is a 10 mile climb at an average of 6% grade to the summit, with an even steeper descent. 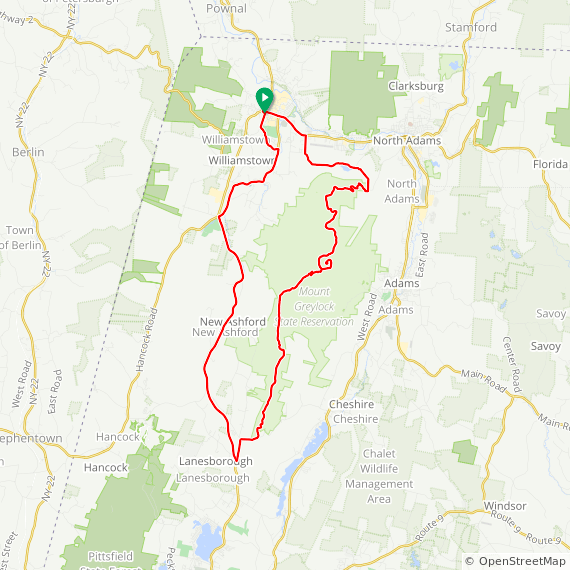 Remote Start option: Drive to Adams and park at the Ashuwillticook Rail Trail Visitors Center for a 24 mile out and back perfectly flat ride. View at RideWithGPS. Ashuwillticook Rail Trail and over Mount Greylock ridewithgps.com/routes/1701729This 45 mile ride starts out clockwise through North Adams and continues south on the Ashuwillticook Rail Trail. In Lanesboro it breaks away from the ride around the mountain and goes to the summit, with a thrilling descent on Notch Rd. View at RideWithGPS . A shorter counter-clockwise ascent of Mount Greylock is shown below. 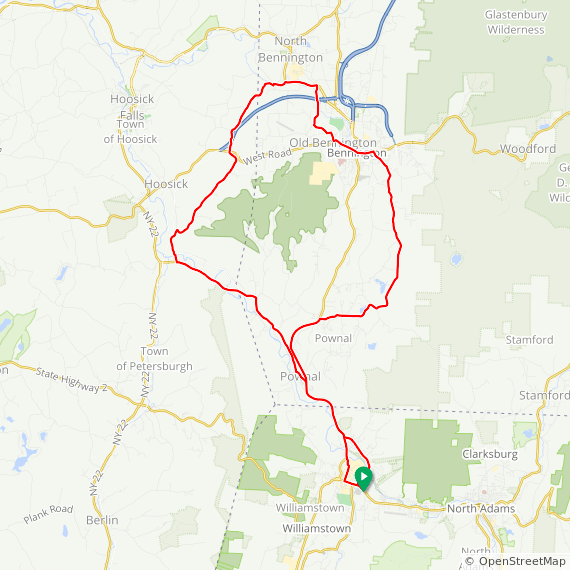 Counter-clockwise version of Mount Greylock Climb: Distance: 36.9 mi., 3591 ft elevation. (Average climb/descent for ride is 3.7%). Average grade for 10 mile Greylock climb is 6%; with sections that have 10% grade or steeper. Worth the climb! View at RideWithGPS We head south from Williamstown on wide-shouldered Rt. 7 toward Mount Greylock (elevation 3491′) . This is the best climb in Massachusetts and the road to the summit was totally rebuilt a couple of years ago. The 10 mile climb from Lanesborough to the summit averages 6% grade, with some sections considerably steeper. The steeper 6 mile descent on the other side to North Adams is awesome, but be prepared for very steep descents and sharp hairpin turns. 16 mile remote start option: Drive to the Mount Greylock Visitors Center and ride 8 miles up then 8 miles back down the same way. Williamstown-Natural Bridge loop. Distance: 25.1 mi. , 1840 ft. total elevation. View at RideWithGPS Flatter options and short route to Natural Bridge and back is 19 miles. While in Williamstown visit the Clark Art Museum and the Williams College Museum of Art. Mass MOCA (Museum of Contemporary Art) has massive exhibits, and a performance on Friday evenings.